It’s oh so trendy this time of year to say: I’m going to knit the stash. There are groups dedicated to this issue on Ravelry and in the blogging world. There are support groups and all those knitting-nay-sayers egging you on. Sure a yarn diet sounds good, like spring cleaning and resolutions but is it really the way to go? Year after year I make the same type of deal with myself. I decide only to buy yarn for dedicated projects, I decide I can only get 1 ball for every 2 knit from the stash, or I decide it’s one UFO for every new O. But this year is going to be different! This year I’m going to knit with yarns I haven’t knit with before. I’m going cast on a new project today and enjoy it. Revel in the newness of a technique not tried before. It’s going to be a year of new instead. 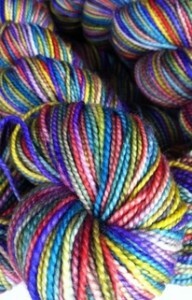 While the yarns in it might rotate, the stash will still be there next month, and probably the next one too! So I say take a class, try a new project, or a fiber you’ve never worked with before and enjoy! This entry was posted on Friday, January 11th, 2013 at 2:45 pm	and is filed under Uncategorized. You can follow any responses to this entry through the RSS 2.0 feed. Both comments and pings are currently closed. What’s the yarn in the photo, Alexa? I think I need it!